As the son of fallen televangelists, Jay Baker is an unlikely candidate to be talking about the grace of God but he does it passionately in Fall To Grace. Rather than getting bogged down in what happened to him and his family, he focuses on the grace of God he discovered. It is such an important message because there are no doubt many like him who grow up in church but never hear or grasp that God’s grace is a free gift that they do not need to earn through doing the right thing. While his passion is admirable and he says some things that are very important for people to hear, the book does have some significant flaws. While certainly we cannot in any way earn our salvation, right living is the worshipful response we should be making to God’s grace. Holiness is not an optional added extra we can take on if we want our lives to work a bit better. That does seem to go missing book. It makes it sound as though grace means you can do whatever you want and should let others do the same. He also tends to ignore or dismiss scriptures that don’t fit his ideas and uses some questionable theological interpretations. These problems are all quite evident in his defense of homosexuality. 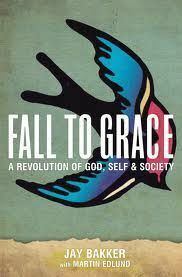 The book is an interesting read, but one that needs to be approached with a good deal of discernment. His passion is inspiring and he says many wonderful and true things about grace, but the incomplete or questionable theology he demonstrates at times prevent me from giving this book an unqualified recommendation.